It’s the start of your first IRONMAN, you’re lined up with your wetsuit zipped, swim cap on, nervously checking goggles for the tenth time. The throngs of people around you waiting for the gun to signal the rolling start are doing the same: swinging arms, stretching, hopping up and down. The energy is palpable. Even experienced triathletes will find heart rates elevated and hormones firing in anticipation. 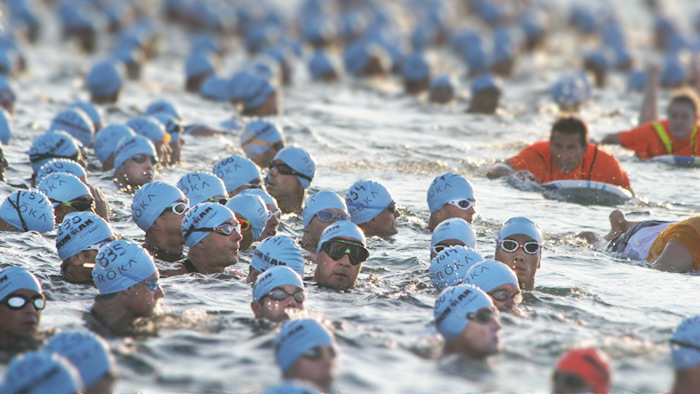 For many, the swim is the scariest part of the day. I hear over and over, “If I can just get through the swim, I’ll be fine.” As a coach, I want my athletes to be confident in their ability to not just get through the swim, but to limit the excessive emotional and physical stress to save reserves for the rest of the day. Poise, self-assurance, and buoyancy should rule the swim. As someone who learned to competitively swim as an adult, I’ve stood in the shoes of the petrified IRONMAN athlete, contemplating a sea of floating people, and moved on to top age group swim results with much less stress. It’s a process of work that involves many layers from form and technique to swim fitness and confidence. There isn’t a magic pill that can get you from point A to point B, but there are focus points every new and experienced swimmer should consider. I asked one of my athletes, Karen Burbella, a former Division I swimmer and holder of the fastest female swim split at the USAT Nationals in 2015, what she thought were the three most important things for a swimmer to consider when working on swim efficiency. She summarized them as head position, body position, and ankle flexibility. Many triathletes lift their heads too high when breathing, and this action causes the hips to sink. Breathing should be a tilt of the chin with one goggle out of the water and one goggle under water. Triathletes spend way too much time looking forward, keeping an eye on the buoy instead of making a deliberate movement to sight and then turning eyes and head back down. Sight every 8 to 10 strokes, then focus on your body position. This can be practiced in the pool by selecting a spot to sight before you begin. Make a quick, efficient lift of the eyes, find the target and then go back to proper form, looking to the bottom of the pool. While doing sight practice, try breathing every other, 3rd, 4th and 5th strokes. Don’t fall into the trap of staring at the feet of the person in front of you for the entire swim practice. This can lead to a habitual lift of the head. Looking to the bottom of the pool allows for better balance because the head weight is carried further from the fulcrum. You’ll also get better arm movement because the neck can restrict shoulder movement when it is tight. Body position is essential to every aspect of swimming. The spine is connected in three areas: the head, ribs and hips. Think about how these three pieces align and lengthen the spine. Swim ‘long’. Outside of the pool, this can mean yoga, core work, and general posture changes. In the pool, Karen recommends side-kicking drills. On your side, practice breathing by turning the head just enough to get air, while holding body position. Hold the underwater arm up against your ear, lightly scull with that hand and keep the other arm alongside the body. Roll your head to breathe, keeping half of the head submerged. Fins can assist in this, or a kickboard held by the underwater arm. If you kick with your feet flexed (dorsiflexion), you will go backwards. In this situation, kicking is a hindrance to the swimmer. Two of the major muscle groups in the ankle are the dorsiflexors and the plantarflexors. The dorsiflexors, primarily your tibialis anterior, raise the ankle in an upward direction while the plantar flexors, primarily your calf muscles, point the ankle in the downward direction. Both are important. Foam rolling the calves, pointing and flexing the feet using stretch bands, performing heel raises and drops on a stair and using a wobble board or balance board to stand at an angle in dorsiflexion are all good ways to focus on and develop mobility and range in the ankles. Using fins and being mindful of the range of motion in your ankles can allow you to work on this skill while you swim. Adult triathletes have plenty to work on when becoming more efficient and faster swimmers. Keep the amount of ‘new’ things to a minimum and focus on the basics. Remember, often it isn’t your fitness that is holding you back, it is your form and efficiency. Take the time to learn the right way to swim, and your race day results will reflect your efforts.